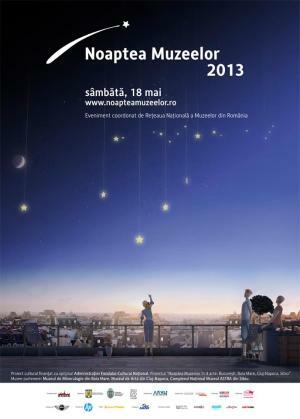 During the night of May 18th 2013, museums of Bucharest will await visitors with the regular and special exhibitions, concerts, dance, theater, movies and interactive events. Visitors may choose to either spend their night between the 18th and the 19th going through museums and cultural organizations that have already instilled a tradition when it comes to celebrating the Night of Museums, or visit cultural organizations that joined in 2012 or just this year. In order to plan out much easier their own possible itinerary, the visitors are kindly invited to use the maps containing the Night of Museums program in Bucharest (available in Romanian). The maps are printed within the project "Night of Museums in four acts: Bucharest, Baia Mare, Cluj-Napoca, Sibiu", coordinated by the National Network of Romanian Museums. Cultural project funded by the National Cultural Fund Administration. "Night of Museums" Festival in Bucharest. You can get here description, reviews, address, time and details of "Night of Museums" Festival in Bucharest. Visit Bucharest Tips for more Festival events in Bucharest!